In this review, I will write about two affordable loudspeakers from two companies: Fluance and Micca. Let’s find out whether is it worth to buy more expensive SX6 or maybe MB42 will be enough for you. 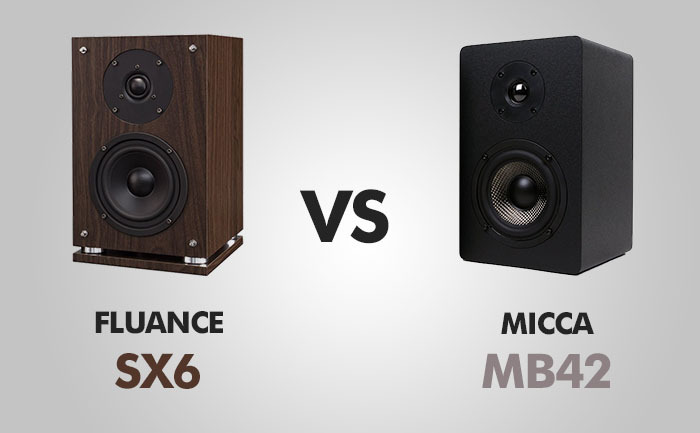 Fluance SX6 speakers are much taller than Micca MB42X. The veneer finish of SX6 made an average impression on me. It’s not bad, but not great either. Micca’s build quality feels sturdy with light 3/8′ vinyl covered particle board. It definitely feels fine for the price and looks like it can last for many years. The rounded corners make a better impression than SX6 sharp ones. SX6 comes in two colors black and natural walnut. MB42 comes only in black. First of all, these speakers are passive. This means that they don’t have a built-in amplifier. Amp is a must have item for any home theater system. You can buy it on Amazon. Times, in which you had to have huge speakers to get a great sound are long gone. Now, you can get a great sound from a much smaller model. Both of these speakers sound great, not only for the price but probably better than many other, more expensive models. Before comparing speakers you should let them play for about 40 hours. It’s the break-in period. After this time, they should sound better than the first time you played music on them. The sound quality in SX6 is great and consistent with different amps, with varying power ratings. I recommend to give them around 80 to 100 watts of power, of course, you can run less, but if you want their true potential, you should keep the higher wattage. They are designed as bookshelf speakers, but you can also use them in your home theater. They offer clear and crisp mids and highs, that really shine in vocal tracks. Bass, in the beginning, was almost undetectable, but after a few hours of break-in time, they started to sound truly great. Micca MB42, despite its small size, can reproduce a great sound. Even bass is not bad for a 4-inch woofer, reaching down to 60 Hz. In this case, a subwoofer would be an optional addition, not a necessity. These speakers are rear ported, you should have some space between a wall and a speaker to get full bass potential. What is better with these speakers, are mids and highs, both are crisp and clear, making it a good use as front and rear surround speakers in a 5.1 home theater system. PROS: Great quality for the price / Good bass / Great highs and mids. PROS: Great quality for the price / Great highs and mids. CONS: Average veneer finish / Bigger than Micca. CONS: 4-inch woofer is worse than 5 inch for bass / You need to have space between a wall and a speaker. Although Micca MB42 is great for the price, when you compare SX6 with MB42 in specs, SX6 is better in almost every aspect. So you should go with Fluance, especially if you don’t mind having speakers that are 4 inches taller than Micca MB42. Expect more bass from SX6, without the need of buying an additional subwoofer.